The goal of this program is to improve health conditions in 28 rural communities of Aromo Sub-County in Lira District of the northern region of Uganda. This program is undertaken with the financial support of theGovernment of Canada, provided through the Canadian International Development Agency (CIDA) in partnership with Ryan’s Well and Divine Waters Uganda. It focuses on reducing water related diseases by increasing coverage and improving access to safe and potable water and sanitation for 16,600 inhabitants, of which 6,000 are children, youth, and teachers who attend schools. The project approach develops capacity of local organizations and local government authorities to incorporate training activities in health, hygiene, management and maintenance into water and sanitation infrastructure programs. 3-Dec-2012 – It’s been a busy fall in Aromo! Three successful training activities, 4 new deep wells and 2 shallow wells are now complete! 13-Aug-2012 – Learn more about training activities during the rainy season and people of Beo A and Acan Dano villages. 1-June-2012 – See photos of Bar Ongin village well in our recent Year 2 update and a site list of completed projects. 23-Jan-2012 – Learn why the dry season in northern Uganda makes for a productive time for drilling wells and constructing latrines! 17-Nov-2011 – The last few months have seen further training of hygiene trainers, construction of 4 more wells and additional progress on 5 latrines. Learn more and see before and after pictures! 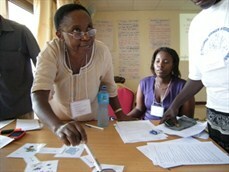 20-Sept-2011 – Learn how community water and sanitation training is providing communities with positive social, economic and health impacts. 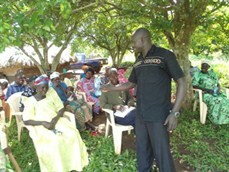 It has a busy time in Uganda for the team at Divine Waters. The rainy season through November created some challenges with construction but provided more time for training activities including hand pump mechanic training and the recent Community Health Promotion workshop. Divine Waters has also been able to initiate a pilot project for Community-Led Total Sanitation (CLTS) in Wigweng Village. All of this was accomplished while also completing another 6 wells and starting construction of the last latrine block for Walela Primary School. Ten individuals from Aromo Sub-County joined the Lira District Hand Pump Mechanic Association training lead by Divine Waters. Creating a group of skilled mechanics in the area is essential for communities to be able to maintain their wells. 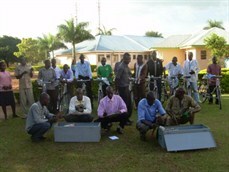 The group from Aromo also received bicycles to move from site to site and 2 tool kits were purchased for use. The tool kits will be kept at the sub-county office and signed in and out when the mechanics need to use the tools to repair pumps. The workshop brought together 5 NGO partners from Uganda and Kenya along with sub-county and district health assistants and community development officers. Lead by expert trainers from Seeds of Hope/AFMAC in Zambia, the workshop provided 10 days of learning and experience for participants. Ryan’s Well Program Manager, Julie Truelove, participated in the first several days of the workshop and you can read more about it on our blog. CLTS is a more recent method to engage households and families to improve sanitation and hygiene in their community. While Divine Waters and local health assistants help guide the process, CLTS relies on residents of each community to lead the process as the name suggests. Wigweng village was identified for this pilot project given their strong involvement with the well construction and of the 50 households in the village, 34% had latrines. The goal is to increase this to 100% of households and declare the village free of the shameful practice of open defacation…that’s what people do when they have nowhere else to go! Four new deep wells and the final two shallow wells were completed in the past few months. All of the activities to date have reached over 19,600 people in Aromo Sub-County! The coming months will see completion of the final three deep wells and latrine for Walela Primary School. Follow up training of hygiene trainers will continue along with monitoring of well sites. Rains have been bringing much needed moisture for growing season in northern Uganda. Rains also lead to muddy roads slowing down the drilling and construction of wells. It is a good time to make progress with training, mentoring and building skills. Deleo Ocen and his team at Divine Waters have been focusing on continued training of water source committees, advancing the school mentoring program and following up with participants of the training of trainers (TOTs). This follow up is to ensure participant’s own homes set a good example for sanitation and hygiene behaviour in their communities. Divine Waters is also working with the new Hand Pump Mechanic Association in the sub-county to screen applicants for the upcoming pump mechanic training. The two final shallow wells of the project were also completed in the past two months for Beo A and Acan Dano Villages. These wells are providing water for over 1200 people including Johnson Opito of Beo A Village andStella Apita of Acan Dano Village. Drilling underway in Johnson Opito’s village in June 2012. Johnson Opito was one of the leaders in the Internally Displaced Persons camp in this region prior to 2005 during conflict with the LRA. As a community leader, he practices good hygiene and sanitation regardless of his age. At 67 years old, Johnson is one of the elders of Beo A village and now benefits from a new shallow well in his community. Practicing good hygiene and sanitation began at the time when his father was working as a councilor in Lira District in the early 1980’s. The importance of proper hygiene and sanitation at that time made him “grow in love” with cleanliness. The additional health and hygiene training he received with the TOT’s program made Johnson think that he cannot live without a latrine, bath shelter, drying rack and a tippy tap for handwashing at his home. Now, Johnson says his home is respected because there are no risks of illness like diarrhea or cholera since he practices good hygiene and sanitation behaviours. Drilling underway in Johnson Opito’s village in June 2012. Stella Apita collects water at the new Acan Dano village well. Before the new well in Acan Dano was built, Stella Apita, a 24 year old woman, had no time with her family or friends because she spent her days walking a long distance to fetch dirty water that could make her and her family sick. Now, because of the new shallow well in her village, she doesn’t have to walk far to fetch water and she can spend time with family and friends along with being able to “double up” on the cleanliness of her home. Stella is thankful she had the chance to learn new things on hygiene and sanitation that she didn’t know before. She can also be confident that when she serves water to her family it is safe and won’t harm them. Learn more about the progress in Aromo with our Year 1 Update (PDF). For more in-depth information on the impacts and outcomes of this project, see the Second Interim Progress Report (PDF) submitted to CIDA. Our partners at Divine Waters Uganda are doing an incredible amount of work and making progress for the people of Aromo! While the dry season in northern Uganda brings many challenges it makes for a productive time for drilling wells and constructing latrines. Roads are dry and stable making transportation easier for our partners at Divine Waters. Drilling wells when it is the dry season – when the water table is at its lowest point – helps to ensure that drilling is deep enough to pump water even at the very driest times of year. This helps to ensure that water will be accessible all year round when the well is complete. School latrines are now complete with an improved design including rainwater harvesting for handwashing, a private washing room for girls and, where feasible, a drainable pit so that the latrine can be pumped out like a septic tank – a more sustainable design for the future. Continued training of the local Water Source Committees will help to support sustainable management of wells and latrines. Second “Training of Trainers” session held to further engage hygiene trainers and integrate with Village Health Teams. Our partners at Divine Waters have used the last few months to further training of hygiene trainers, construct 4 more wells and 5 latrines that are near completion. 10 hygiene trainers learned about keeping water safe, handwashing, their role in collaboration with local Water Source Committees for operation and maintenance of wells and shared roles for males and females in house water supplies and sanitation. Four more wells have been completed for Wipunu, Odoce, Wigweng and Acan Godi villages. Latrines are near completion for Apua Primary School, Acutkumu Primary School, Aromo Secondary School, Akore Primary School and St. Gabriel – Agak Primary School. GPS data has been collected for 9 well sites and mapped. 10 hygiene trainers have been trained to teach others about WASH. Since late March, 5 wells have been constructed and 150 women and 108 men have participated in community water and sanitation training. Of those trained, 45 people (20 women and 25 men) have been identifed as members of the local water and sanitation committees for each well. These activities have already lead to positive social, economic and health impacts. Work continues in Aromo with the rainy season setting in. Identification of locations and construction of 5 shallow wells for Aleka, Lela Dam, Ayang, Arwot Olaro and Apuce communities. Water and sanitation training for 258 people with 9 people per community being elected and further trained to be a member of the local Water Supply and Sanitation Committee. Identification of 6 priority schools with the greatest need for latrine construction. Purchase of 2 motorcycles and 4 bicycles for Divine Waters staff, field supervisor and health trainers to travel to remote communities in Aromo. Many thanks to the commitment of the following supporters for making these projects a reality for the people of Aromo Sub-County, Uganda! With thanks to several anonymous donors! Dago Opele Village – deep well completed to serve 1280 people. Ayitunga Village – deep well completed to serve 1320 people. Abinek Village – deep well completed to serve 1543 people. Te Olam Village – deep well completed to serve 930 people. Acholi Dumu – deep well completed to serve 1650 people. Angole B Village – deep well completed to serve 1023 people. Ajia Good Village – deep well completed to serve 1,243 people. Puna Anyeria/Beo A Village – deep well completed to serve 1,380 people. Bar Odir Village – deep well completed to serve 985 people. Okio Village – deep well completed to serve 1,025 people. With 3 final deep wells underway! Aleka Village – completed to serve 445 people. Lela Dam A & B – completed to serve 600 people. Ayang Village – completed to serve 345 people. Arwot Olaro Village – completed to serve 385 people. Apuce Village – completed to serve 1280 people. Wipunu Village – completed to serve 498 people. Odoce Village – completed to serve 380 people. Malyam Ayesu – completed to serve 745 people. Acan Godi Village – completed to serve 1200 people. Atwero Village – completed to serve 445 people. Bar Ongin – completed to serve 600 people. Adag Anii Village – completed to serve 345 people. Adag Woo Village – completed to serve 385 people. Acan Dano Village – completed to serve 543 people. Beo A Village – completed to serve 770 people. All shallow wells are now complete! Acutkumu Primary School – completed to serve 298 girls. Apua Primary School – completed to serve 476 girls. Akore Primary School – completed to serve 519 girls. Aromo Vocational School – completed to serve 536 boys. Agak Primary School – completed to serve 536 girls.